Some of the most important wearables aren't found on the high street. While a Fitbit can be great for your long-term health if it gets you moving and exercising more, there are also wearables that an actual doctor might 'prescribe' – and some already are. From diagnosing heart arrhythmia to monitoring diabetic's blood glucose and helping out with stroke rehab, wearables already have a place in medicine. We've picked out five of the top wearables that have the power to transform health, if they are not doing so already. Spend too much time obsessing over tech and believing the crowd-funded promises of start-ups and you could start thinking wearables are about to cure cancer. However, a much more realistic, and just as pressing, goal is to take pressure off the health service. That's Snap40's aim. It's a relatively small diagnostic tracker, worn on the upper arm, that monitors several metrics, and can identify deterioration in patients to avoid them having to spend days or weeks in a hospital bed. This is all the more important with healthcare on the brink of implosion in the US, and the UK's NHS under constantly increasing pressure. Snap40 "has been clinically proven to monitor heart rate, respiratory rate, oxygen saturation, temperature, change in systolic blood pressure, motion and posture within a clinically acceptable level of agreement," according to its makers. 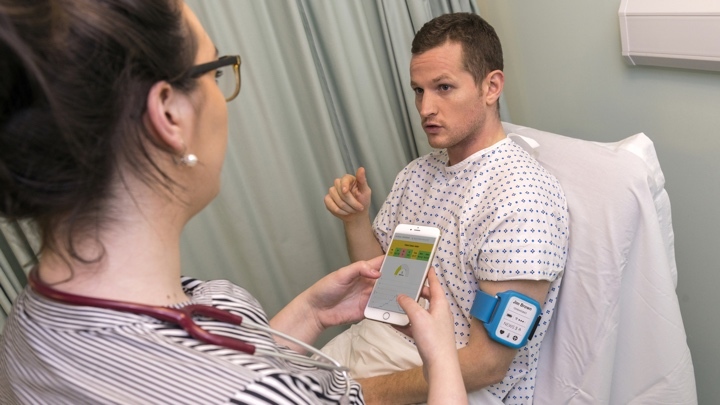 It uses Wi-Fi to transmit its readings, giving doctors and nurses access to them whether the patient is at home or at the hospital. Snap40 sends out alerts when readings cause a shift of the wearer's EWS score, which is a system that determines how ill a patient is using a series of metrics. In February 2017, Snap40 announced a million pound contract with the NHS, to further develop this smart approach to triage. One of the first diagnostic tools for any strange heart behaviour is a holter monitor. This consists of a Walkman-like (or iPod-like for the younger Millennials) battery unit and a series of sensors stuck to various parts of your chest. It is used to monitor heart behaviour for a longer period than the 30 seconds you might get in a doctor's surgery: usually between 24 hours and two weeks. While not painful to use, a traditional holter monitor is clunky and inconvenient, and some of the pads can often end up falling off after a while. The iRhythm Zio XT does the same job as a standard holter monitor, but in a much friendlier, wire-free package. Its sensors and battery unit are all part of the same water-resistant patch, making it easier to apply and less easy to accidentally pull off when removing or putting on clothes. There's a button on the top of the main module, which lets the wearer create a 'time stamp', to signal any sensations or actions worth noting. These are then jotted down in the Zio app. The Zio XT is just one of a number of smaller medical heart rate monitor devices, but it's already in use among healthcare pros in the US. The average woman of child-bearing age is fertile for six days a month. Narrowing down these days can be done by measuring basal body temperature every day, as this is a good indicator of hormone levels in the body. Basal body temperature is the lowest temperature your body reaches, usually between 2-6am. While there are several basal tracker solutions, Yono Labs's one is a little different as it's an earpiece you wear while sleeping, letting it find the lowest reading available rather than relying on a single reading you'll do as soon as you wake up. Yono takes a measurement every five minutes as you sleep, and then transmits them to a phone when the earpiece is docked with the base station charger.The data is then grafted onto a calendar in the app, to let the user see fertile days and how regular their menstrual cycle is. The two primary uses are obvious: Yono can help people get pregnant, and also help them avoid it by taking additional prophylactic measures during the fertile phase. However, it can also be used to monitor the early stages of pregnancy, as a drop in basal body temperature is enough to merit a trip to the doctor. Diabetes monitoring was one of the earliest touted medical uses for wearable tech, most notably in the form of an experimental contact lens Google co-designed back in 2014. Dexcom makes diabetes-monitoring tech real people are already using, though. The Dexcom G5 is a sensor worn on the belly that constantly measures glucose levels in interstitial fluid, the liquid that surrounds tissue cells, and blood. Its patch has a needle that sticks in your skin. Now, for those who don't already deal with diabetes, the normal procedure for glucose monitoring is the finger prick test, where a device is used to stab your finger and monitor blood glucose directly several times a day. While not as painful as it sounds, it's not exactly comfortable, and the Dexcom G5 instead lets the wearer monitor their glucose levels throughout the day, making it much easier to correlate behaviour with glucose level dips. The app will also notify of high and low readings, meaning the user doesn't have to rely on that feeling of being 'out of it', or about to pass out, to realise they're 'low'. The Dexcom system is rather expensive, and requires new sensor units every three months. But there's now also a newer, much cheaper alternative. The Freestyle Libre has coin-shaped $60 sensors that last two weeks, and a $60 reader that picks up and displays the sensor data. Physiotherapy is a powerful tool, but getting patients to actually perform their exercises day-to-day can be extremely difficult. The Rapael Smart Glove gamifies the process in order to alleviate the tedium. It looks like a robot arm, but is actually a complicated motion controller. As well as nine-axis motion tracking, each of the finger parts is a variable sensor that can tell how far the digits are being moved. Neofect has produced an Android-based software platform featuring dozens of games and game-like exercises designed to gradually increase hand strength and range of motion. Every now and then, the patient can head to the evaluation section, which tests the full range of motion of wrist and fingers, to check for progress. The Smart Glove is designed for the sort of rehab needed after a stroke rather than a less serious sport injury, and doesn't apply significant pressure for general strength building. It's all about adding context to what can be a very frustrating and painful process.